The United Nations Children’s Fund (UNICEF) and Generations For Peace have today announced an expansion of their Social Cohesion in Host Communities Programme. The programme, funded by UNICEF and with additional support from Jordan Olympic Committee, Samsung, and Manaseer Group, works in partnership with the Ministry of Youth (MoY) and the Jordanian Hashemite Fund for Human Development (JOHUD) in youth centres and community centres in urban centres and towns (host communities) with large numbers of Syrian refugees. In these host communities, both Syrian refugees and Jordanian youth are under enormous pressures, and face heightened tensions and risk of violence, greater vulnerability, and high chances of resorting to negative coping mechanisms such as isolation, school dropouts, child labour, and early marriage. Over the last two years the programme has directly involved 1,600 Jordanian and Syrian youth participants, female and male, in 16 communities in Ajloun, Amman, Irbid, Karak and Mafraq. Innovative sport and arts activities over a series of sessions provide 44 hours of quality participation time together, to foster greater engagement, acceptance and trust. Evaluations of the programme have provided evidence of positive impact: transformed capacities, strengthened relationships, social capital and resilience, and reductions in violence and vulnerability. The programme is now expanding from 16 to 40 communities, and will involve 8,000 participants in 2017. 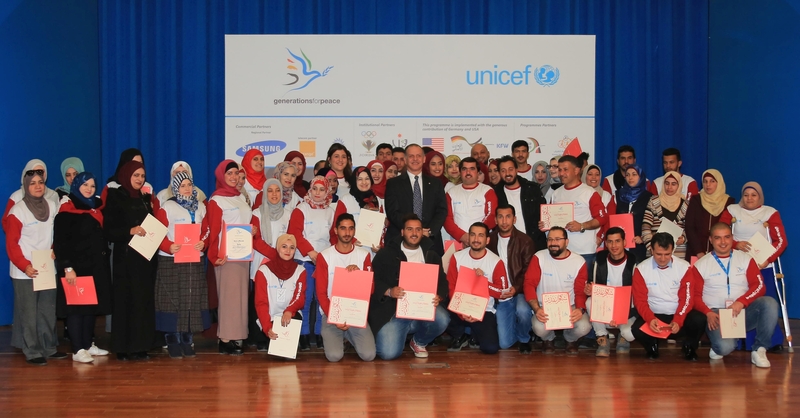 The announcement followed the presentation by Generations For Peace founder and chairman, HRH Prince Feisal Al Hussein, of certificates to Generations For Peace youth leaders for their outstanding delivery of the programme over the last two years. The certificates marked the graduation of these youth leaders as Generations For Peace Pioneers, and it was especially motivating for them to receive their certificates from HRH Prince Feisal Al Hussein in person, in recognition of their dedication and hard work to support their communities and Jordan’s nation-wide response to the Syrian crisis.